There are curries… and then there are curries! This type is typically served in Malaysian homes and is made with a mildly spicy yellow curry paste, bell peppers, okra, onion, tomato, eggplant, and coconut milk. 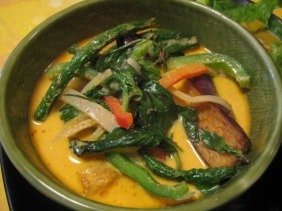 This original Thai curry (which gets it’s heat, flavor, and name from fresh red chilies) is blended with bamboo shoots, bell peppers, onions, sweet basil, eggplant, and string beans, then simmered in coconut milk. 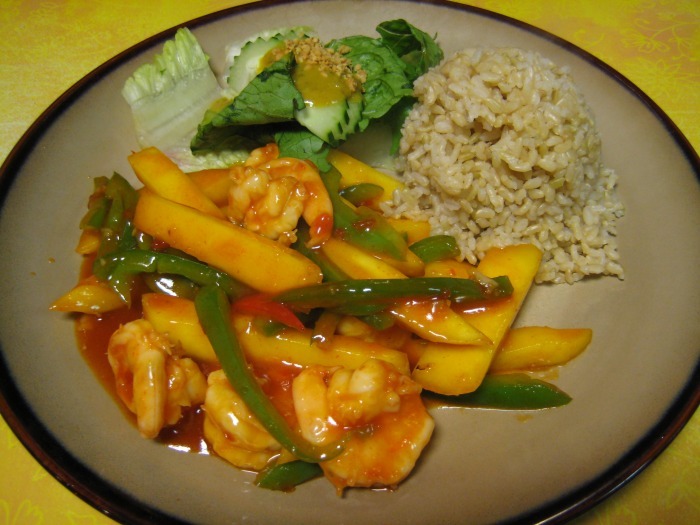 Fresh slices of juicy mango are sautéed with bell peppers in a spicy citrus glaze and presented to you in mango shells. Fragrant sweet basil leaves are stir-fried with bell peppers, onions, mushrooms, and bamboo shoots. This local Singapore favorite gets it’s flavor from the fresh red chili peppers in the spicy Sambal sauce. Julienned ginger and scallions are stir-fried in our chef’s special oyster sauce. Aromatic cashew nuts are sautéed with bell peppers, onions, bamboo shoots, celery, and mushrooms in a mild chili sauce. The secret to these crispy string beans is our expert Thai dry-sautée method. Then we round out the dish with bamboo shoots, bell peppers, onions, and sweet basil. The flavor of this popular Chinese vegetable (literally “mustard orchid”) is complemented by ginger, garlic, carrots, and mushrooms. Onion, bell peppers, okra, pineapple, tomato, and mango are simmered in a spicy Thai sauce of coconut, green chili, and basil. The flavor of the eggplant is complemented by delightful hints of herbs and spices, bell peppers, onion, scallions, and sweet basil. Bite-sized morsels of tenderloin steak are marinated in special seasonings and stir-fried with onions and chives. You'll find yourself chewing more slowly to savor this dish! We turn a block of our perfectly crispy tofu into a masterpiece by jazzing it up with our special oyster sauce, chopped onions, green peas, and julienne sweet peppers. Jumbo shrimp are smothered in a batter of coconut, butter, and egg white, then deep-fried to an exquisite golden hue. This dish is made by simmering flanked beef in galangal, lemongrass, cloves, onion, and a rich coconut curry. The beef is slow cooked to perfection and melts in your mouth! These crispy chicken strips are cooked with five different spices, bell peppers, and onions. This is sure to ignite your palate with the speed of a matchstick! In this dish, we swapped out the heat in our Chili Chicken for a special Thai-style sweet and sour sauce that's pure tangy-goodness. Carmelized shrimp are sauteed with fragrant chili leaves, shredded bell peppers and onions. This trademark of Thai cuisine needs no introduction. Our authentic version features rice noodles, bean sprouts lightly coated with sweet sauce, egg, tofu, mixed veggies, and peanuts. Flat rice noodles sautéed in sweet soy sauce with Chinese broccoli and eggs. broad noodles with basil, red and green peppers, eggs, and onions. Our most popular fried rice is made with chopped cashew nuts, pineapple chunks, golden raisins, and our homemade sauce. This dish is sparkling with eggs, chopped bell pepper, onion, and fresh sweet basil. Fresh egg noodles are served with red onion and bean sprouts in a big bowl of mildly spicy coconut curry broth. We turn your favorite wonton soup a hearty meal by adding noodles to a generous portion of savory wontons. Everything you love about our savory, spicy, and sour soup is this dish plus healthy rice noodles. © 2011 The Green Papaya. All Rights Reserved. 110 Kinderkamack Road, River Edge, NJ 07661.